Enjoying peaceful seclusion amidst luxuriant vegetation on the banks of the Petanu the Maya Ubud Resort & Spa boasts spectacular views of the green valley and traditional terraced rice paddies. Situated close to the cultural hub of Ubud there are a host of entertainment and dining opportunities for guests to discover and explore. 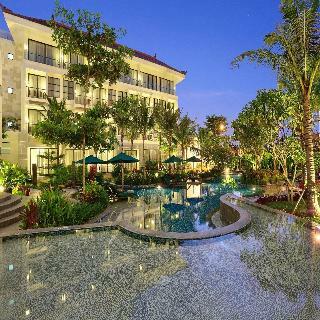 The resort is also located within easy driving distance of Ngurah Rai airport. The contemporary Balinese style of the resort is sure to impress combining a traditional feel with unequalled luxury. Sports enthusiasts and guests seeking the ultimate in relaxation will not be disappointed by the array of facilities and amenities this elegant resort has to offer including a Balinese health Spa, tennis and Yoga facilities. Nestled in a beautiful tropical garden, this venue is the perfect place to escape from the stress and recharge ones batteries. Surrounded by lush green vegetation its guests will truly understand why Bali is called the Island of the Gods. They will be able to easily explore and discover the uniqueness spreading within the surrounding neighbourhoods. The nearby Seminyak and Petitenget Beach present a soothing interlude while waiting for the beautiful sunset. For shopping delights Seminyak Square should never be missed, while amazing selection of restaurants such as the Potato Head, Metis, Ku de ta, Sarong, La Luciola, hu'u bar & nutmeg are all within walking distance. The hotel itself was designed by adopting the grandeur of Balinese architectural style blended with modern elements in order to create a comfortable and elegant place that will attract visitors year after year.Our property is non smoking area neither rooms nor restaurants. Smooking can be able at room's balcony, lobby lounge, hotel gazebo and bar area. This picturesque hotel is situated in Legian, Bali. Its location is strategic, just a 15-minute drive from Ngurah Rai International Airport or 15 minutes away from Legian beach. 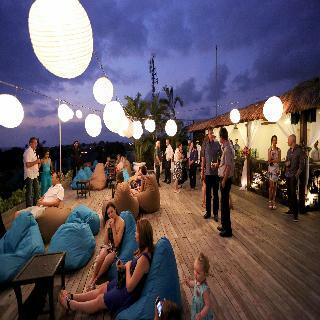 In the surroundings guests can enjoy the lively Seminyak Town or the bars and restaurants along Dyana Pura Street. 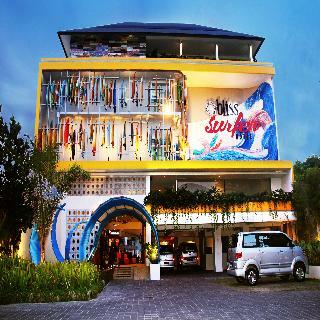 This surfer-friendly hotel, with surfboards prominently displayed on the walls, offers guests who have the chance to stay at this exceptional establishment the opportunity to experience a total connection with the ocean. All of the stylish and colourful rooms have been tastefully decorated using photographs of avid surfers riding the waves. They offer cable TV channels, iPod dock and individual air conditioning, among others. Bombora Restaurant will delight them with its tasty dishes. All customers wishing to take a dip have at their disposal a large swimming pool.